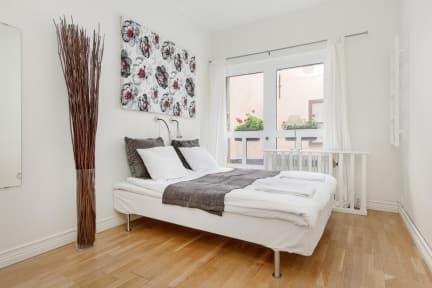 Walking distance to all attractions in Stockholm. Just 250 meters to the Royal Palace. We have 48 beds, in single rooms, double rooms, 4-bed rooms and a uniqe dormitory. Our dormitories are in the basement which are double beds not bunkbeds. The dormitory rooms have a door with lock. All rooms has shared WC and Showers. In Old Town Lodge smoking is not allowed, nor is animals. Open all year. For arrivals before 9 am or after 5 pm please contact us at least 2 days before arrival to arrange for check-in. Bookings for arrival on the day booked must be made before 5pm. We don't accept bookings for more than 10 persons online. 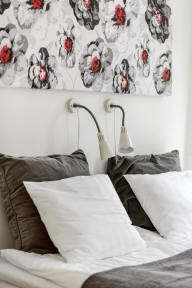 Bed linen and towels could be hired (65 SEK/person one time fee) or you can bring your own. Please note that either way bed linen must be used. Sleeping bags are not allowed due to hygienic reasons. Great location and very easy to check in and out. Clean, comfortable, light breakfast. Staff excellent, helpful with assistance and recommendations. Enjoyed stay (actually, this was a return visit)! Best hostel I've stayed at by FAR! I've already recommended it to all of my friends, including my friends you are from Stockholm. Such a great experience and no worries or hassle. Just simple and great standards! Friendly staff who are happy to answer questions, is a mix of couples and families. The location is amazing. Right inside Gramla Stan a short walk from the metro. I would return another time, good value for the price. Heads up if you need towels/bedding best to arrange it before arrival. There was no staff in the afternoon during our stay (perhaps because of the Easter holidays not sure). We had arranged towels before and everything was set upon arrival perfectly with entry instructions and key left in locker. Very clean location as well. Location in Gamla Stan was terrific!! Location was close to transportation options such as ferries and the T bannen. The after hours entry process was a little different but we figured it out with help from some other guests. Rooms are small but clean. It worked out well for us. We would stay there again when in Stockholm. Fantastic location for the hostel and was given a good sized room. Only downfall was that I got bed bug bites all over my back during my stay there, quite was quite distressing. The hostel itself was really nice and in a great location. The staff was also very nice and helpful. However, our room (private double) had no windows and no air conditioning. It got very hot and stuffy and was always dark so it was hard to know when it was day time. The other rooms appeared to have windows and looked nice, but we were just unlucky. Not a party hostel, not much atmosphere. Was in a great location walking distance to most places repception hours are short but check in process is easy with clear instructions. Only down side is you have to pay for bed linen and towels over all good stay. Terrible place. I was given a room with NO WINDOW and the heat cranked all the way up. There's some tables right outside from the rooms, so a large family was out there treating it as if they lived there, with kids screaming and running around, and lots of loud talking. I could hear more kids running back and forth above my room, very clearly. It was purely miserable. And even at like 6.30pm or so, there was no staff, so I was on my own with all of the problems and decided to go elsewhere.